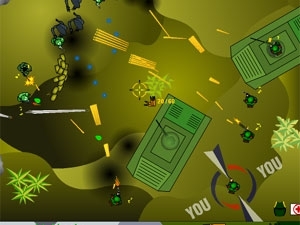 Endless War 3, a fun and addictive flash game, is another bullet in the series of Endless War games developed by Vitaly Zaborov. The nice thing about this game is that it represents a whole Endless War series, including 1 and 2, next to part 3, which is nice if you want to refresh your memory with the older releases. It belongs to the shooter genre with a little bit of strategy, meaning that you are not supposed to walk straight into a battlefield and kill every person (or thing) you see, but that you have to think before you act. That is a nice policy for a start. The game is divided into four campaigns: Iraq War, WW2 – Pacific Ocean, WW3 – Humans and WW3 Mutants (why “WW3” again, I wonder). Each of them represents a different difficulty, starting from the Iraq War as “the easy one”. First thing you notice before starting a level is a little ‘Equipment’ menu from where you can select your weapons, which seems pretty fair if you prefer some weapons more than another. And if you are not satisfied with a choice of weaponry, you can ‘cheat’ and enable all guns in the Options menu. 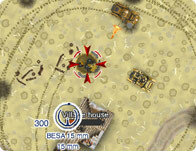 While in the Options menu, you are allowed to enable some capabilities, change difficulty and the quality of graphics. Once you (finally) decided to actually play the game the fun can start! On every first level don’t do anything, just hide (or sometimes even stay where you are) and wait until everyone gets killed – eventually, you will have a free pass to the next level without firing a single bullet (or shooting a man or two, it really doesn’t matter). 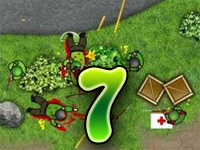 Almost all other levels require a sharp eye and patience, particularly if there is a green land with bushes, a perfect place to lose concentration and not notice the enemy. Don’t you just hate it when you oversee something so simple? What to say – get used to it. Well, at least you see the whole stage from above, so be sure to have a nice look before rushing into death like some people do. I like the fact that this game is challenging and hard, but you can easily “cheat”. Other games in this genre – including strike force heroes 3 are as challenging but surly don’t offer any shortcuts. I am not sure if this is a good thing, but I must admit that it really does not matter in my opinion. Cheaters will always cheat, right? It’s not like you can do anything about that. Honest players (like me !) never look for shortcuts, they are pros ! Another nice thing that I love are the controls – simple and memorable: WSAD for movement, mouse cursor as gunpoint, R for reloading the weapon, G for dropping the gun, 1-2-3-4 for selecting a weapon and the nice, big, SPACE button for the secondary weapon. You just can’t get more simple, but effective controls than that. A flash game wouldn’t be a flash game without glitches, right? There are some, well, interesting bugs that make you wonder “why?” All in all, the action in this game is decent and requires you to use your brain, which is a huge plus right in the beginning. Simple movements yet challenging levels that happen from time to time make this game one of the most amusing flash shooters on the Internet. Oh, and don’t forget that Endless War 3 is actually a compilation of all the previous releases, including a nice choice of weaponry and great gameplay. 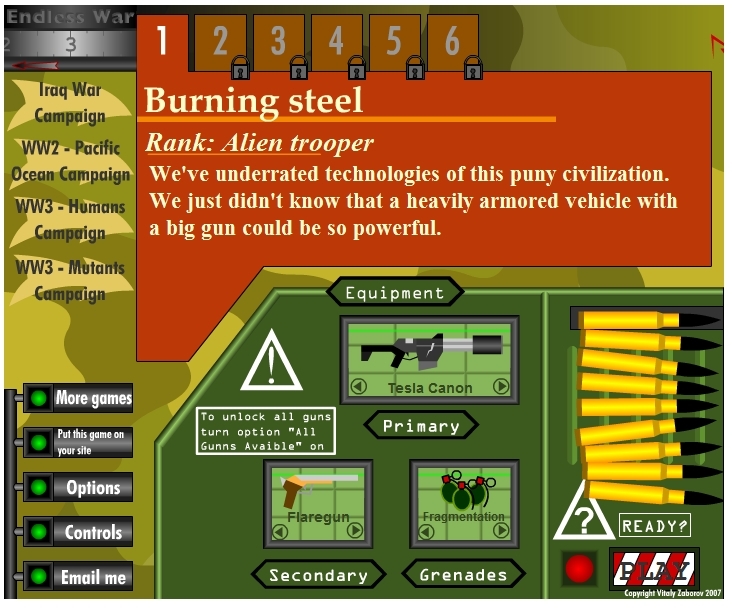 We hope that you will like the Endless War games as much as we liked them. Feel free to share this website with your friends We will add new games to this website from time to time.